Sorrento Valley, CA Dental Practice | Meet Our Dental Team | Vivien Chadkewicz, D.M.D. 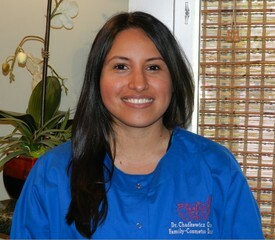 "My name is Jacqueline (Jackie) Ortega and I've been working in the dental field for about four years now! I'm excited to announce I recently got certified as a Registered Dental Assistant (RDA). I'm glad to achieve my goal. I first took an interest in dentistry as a child as I was always the kid who wanted to get my teeth cleaned before any of my two younger sisters. I am originally from San Diego. I enjoy traveling, sky-diving, trying different foods, and dolphins (my favorite animals)!! I also recently got married, and my husband and I have two wonderful dogs (who can sometimes be little pests... but we love them very much). In our free time, we like to take a drive or fly out to visit our friends and family up in Northern California. I really enjoy working at this practice because assisting and getting to know all of our different patients makes me smile! In addition, I also get to work with a wonderful team that makes our job a really fun place to be!" "Hi! My name is Alexandra (Alex) Salas. 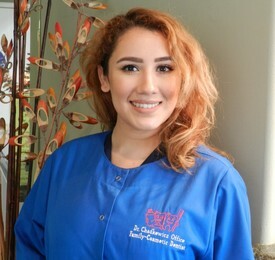 I am a Licensed Dentist in Mexico, but originally from San Diego, and I just recently started my career as a Dental Assistant here in California, to learn more about dentistry with my overall goal of becoming a Licensed Dentist here in California! I am so grateful to have the opportunity to work with Dr. Chadkewicz and to learn more about the profession I love. I love to meet people, talk to them, get to know them and learn about their lives and families. I truly love what I do, and I can’t wait to be able to pursue my career in the future. In my off time, I like to go to the movies (I’m a huge fan of all kinds of movies), being from San Diego, of course I love to go to the beach, and I also like to run occasionally. But most of all, I love to travel and learn about all the different cultures, foods, and histories of the places I visit. I love my team! They are so friendly, kind and patient. Ever since joining Dr. Chadkewicz’s team, I have felt like family and I really enjoy that! I hope you feel that same sense of family when you are here! You really are in good hands! See you in the office!"